In 2010 / 2011, Granby Street finally got a cycle contraflow which links Halford St to Rutland St. Now, cyclists can legally ride directly from the clocktower to the railway station. It’s not a bad facility, apart from one point – the junction with Northampton street. Here, cyclists who have used the weird Rutland St crossing and have continued along Granby St on the largely observed car-free cycle lane to Rutland St are faced with car drivers turning right across them – many of whom don’t expect cycle coming from their right and don’t give way to them. We think this is unacceptably dangerous and an accident waiting to happen and call on the City Council to improve this junction. Someone will be killed unless a city centre junction is improved, say local cyclists. Leicester Cycling Campaign Group [LCCG] is calling for changes to be made to the junction on Granby Street, where a contra-flow cycle lane crosses Northampton Street. 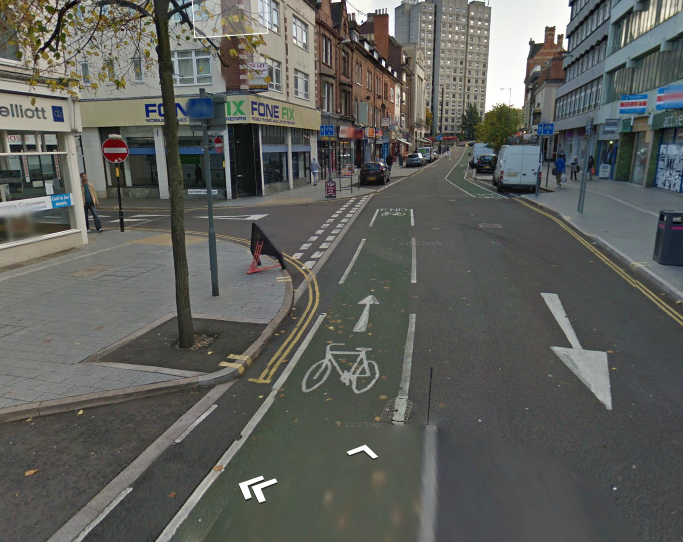 The cycle lane was created some 12 months ago and enables cyclists to use Granby Street in both directions. The contraflow cycle lane starts at Granby Street’s junction with Belvoir St and Halford St. It is situated on the left-hand side of the carriageway until just after the junction with Northampton Street, where it continues on the right-hand side to link with the Toucan crossing over London Road.